This Historical Drama gives us the backstory surrounding writer A.A. Milne “Winnie-the-Pooh” and “The House at Pooh Corner,” these books were published 1926 &1928. Suffering from PTSD after the war, Milne decides to move his family from London and live in the countryside. While there, he found solace in his son and began to write about their afternoons of imaginary play with his son’s stuffed animals. Milne and his family became instant celebrities, while the books brought hope and comfort to the rest of postwar England. The Bottom-Line? I enjoyed this enchanting film and the backstory surrounding A.A.Milne and his family. The film is for ages nine years old and up, as it does have some war scenes. 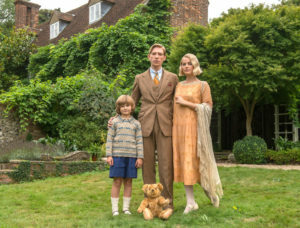 Cast: Domhnall Gleeson as the father and writer, Will Tilston as Christopher Robin, Margot Robbie, as the mother and Kelly McDonald as the nanny.